Workers Uniting – Unite members join USW members locked out by AT! in Brekenridge, PA. 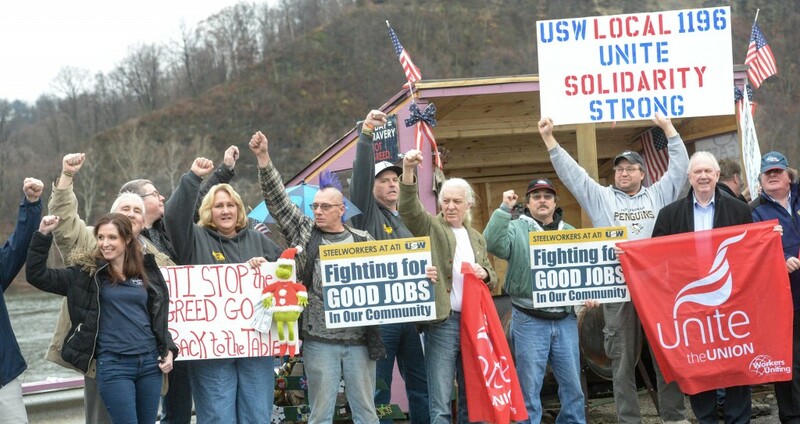 The United Steelworkers (USW) union was informed today by Region 6 of the National Labor Relations Board (NLRB) in Pittsburgh that the regional director will issue a complaint in the four-month-long Allegheny Technologies Inc. (ATI) lockout alleging, in the absence of a settlement, that the lockout has been illegal since its Aug. 15, 2015, inception. The remedy for the company’s violations of the National Labor Relations Act (NLRA) would be to require ATI to make whole all 2,200 locked-out workers for any losses since the beginning of the lockout, including wages and benefits, and to require the company to bargain a new contract in good faith. The NLRB complaint will allege, in part, that ATI bargained in bad faith, both before and during the lockout. The complaint will also allege that ATI unlawfully locked out workers to support the company’s bad faith bargaining positions and permissive demands at its plants in Pennsylvania, Ohio, New York, Connecticut, Massachusetts and Oregon. Under the NLRA, a company is prohibited from locking out workers over permissive demands, which are bargaining demands that do not relate to terms and conditions of employment. ATI stopped bargaining on August 6th and presented the union with a “last, best and final” contract offer. At the same time, it demanded that the union accept it and recommend it to the membership by Aug. 10. When the union would not succumb to this unlawful ultimatum, the company locked out the workers. In Oregon, ATI locked out USW-represented workers after the union would not agree to the unlawful demand that its contract offer be ratified by only the Oregon plant’s members, which would be a violation of the parties’ contract requiring pooled ratification by all the plants in the bargaining unit. The complaint will be heard before an administrative law judge. No date has been set for that hearing. ATI began planning for the lockout in January — months before contract negotiations began — when management hired outside consultants to recruit replacement workers and forced union members to sit through captive-audience meetings aimed at intimidating them into accepting concessions.